Who don't I like tahini? I love sesame seeds, so it makes no sense. I have tried many brands, including Trader Joe's and the famous one from Philadelphia. I have to face the facts, that I just won't be friends w/ tahini. I was craving hummus and posted a pic on instagram and facebook. I received many requests for a recipe, so here it is. I ate this with a toasted pita and loved it. I use a mini chopper.....that I can't live without. Best appliance I own. Whiz the chickpeas w/ a little of the olive oil, sea salt, almond butter and lemon juice. Then add in more of the oil until the mixture is creamy and smooth and the consistency you like. Taste and adjust seasoning to your liking. Place hummus in bowls and decorate w/ avocado half and grilled asparagus. Sprinkle with sesame seeds. Serve room temperature for best results. By the way, I never refrigerate my hummus....it never lasts that long anyway! I too have tried several brands of tahini. Has an odd taste to me. Funky. Almost rancid. And I too like sesame seeds and sesame oil. It is still hummus! Just not hummus bi (with) tahini. More like hummus bi almond paste. All good. I add garlic and a little water to mine. My huge peeve is with cooks who tell me their "take" on hummus and describe a dish with no garbanzo. Insane. 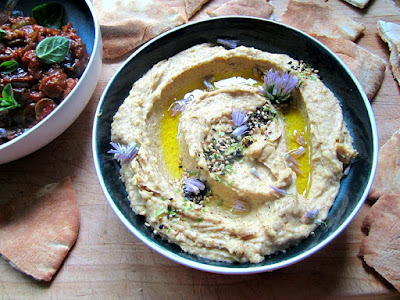 Funny, but I’m not a big tahini fan either, and always make my hummus without it too. I like your sesame seeds topping idea and recently discovered the “everything but the bagel” mixture at TJ’s. It would be perfect with your hummus. Have you seen it or tried it?